Bill Hillmann has trained the most High Point Derby Dogs in American Field Trial history. Each of these dogs went on to earn their Field Trial Titles and one a winner of the National Amateur Retriever Championship. FC AFC Sunday Hawkeye – 1979 NDC, AFC Hawkeye’s Viking – 2002 NDC, NAFC FC AFC Hawkeye’s Coast Guard – 2003 NDC, FC Hawkeye’s Red White and Blue – 2005 NDC – 2006 High Point Open Dog, FC Hawkeye’s Sea Wolf – 2007 NDC, and AFC Coolwater’s Knockout – 2008 Purina Derby Champ. Most problems in dog training are caused by an imbalance somewhere in your training program! Learn to train your own BALANCED RETRIEVER! Learn the secrets of retriever training pros in these new DVDS! This DVD will teach you how to raise your new puppy so that he will grow up to be the dog you have always dreamed of – even if you have never trained or owned a dog before, and no matter which breed you have chosen. From the time the puppy gets home from the airport as a 7 week old puppy until he becomes a gawky teenager, every part of his upbringing is filmed so you can watch him grow up right on your screen. To Bill, it is during the Fundamentals when your dog develops its character. 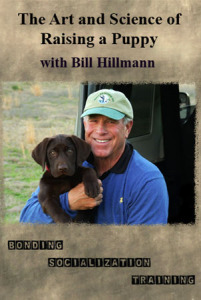 Bill shows you how to teach your dog to develop the natural instincts he was born with. During water training it is vitally important to take the right approach, as this is where your dog develops his water attitude. In this video Bill shows you how to maintain the right attitude in your dog during the difficult phases of water training. Developing the right water attitude can make the difference in having an average dog or having a great dog! In any sport the Fundamentals are crucial for success. 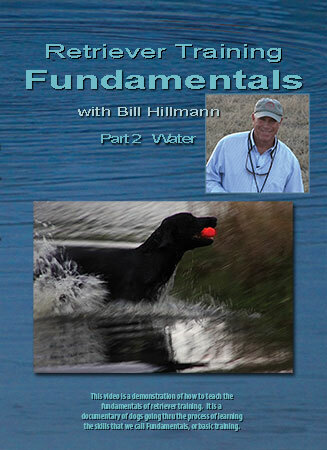 In this video Bill actually demonstrates how to teach the Fundamentals of retriever training. 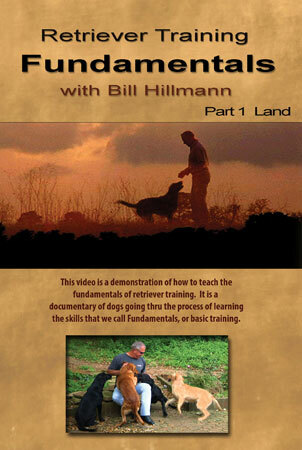 Bill takes various dogs through each step of his basics program showing you how dogs learn. This video shows how to teach a dog to sit, stop on the whistle, go when commanded, to cast, to go through obstacles and cover. All of these skills are taugh by teaching a retriever to handle. We show what to do if things DON’T go right, and all in easy step by step lessons to teach your retriever the fundamentals needed to be a dependable gun dog or more! Traffic Cop teaches the ‘SIT’ Command in a TOTALLY NEW way! Bill teaches you how to use low E-Collar stimulation to reinforce the ‘sit’ command. The E-Collar is NOT used as a correction. Bill uses this technique to also teach older dogs better line manners for competitions. This DVD reveals a TOTALLY NEW way of starting a retriever puppy!! Bill uses his ‘Traffic Cop’ system to TEACH what the command ‘SIT ‘ should mean to every dog. The Revised Edition shows 3 different retriever puppies being trained in front of the camera. This method works beautifully with a Labrador Retriever, a Golden Retriever or any breed that you want to teach to be a great retriever. Bill shows a revolutionary NEW way to teach the conditioned retrieve previously known as ‘Force Fetch’. Teach any gun dog how to retrieve using this happy and fun new method. A dog can be happy during ‘Fetch’ training! Bill give’s you a plan to teach your dog the 3 most important commands – commands that can develop skills that will make it possible to be in almost any situation with your dog and be in CONTROL.